The Center for Initiatives in Jewish Education (CIJE) has developed a significant partnership with the American Technion Society and, with the help of Tova Kantrowitz, Technion Chief Strategic Liaison, were fortunate to host a special, Girls STEM Day at the Jacobs Cornell Technion Institute on Roosevelt Island on March 18th, 2019. Students representing Stella K. Abraham HS, Tichon Meir Moshe, Yeshiva University HS for Girls, and Bruriah participated in the first CIJE-Technion event. As the girls walked into the Cornell-Tech makerspace, they were greeted by the professional staff of the NYC First STEM Lab, as well as by stunning views of Manhattan on a spring-like day. The girls toured the dream makerspace and were shown many tools for use in designing their projects. Notably, this lab is outfitted with a 3D printer (Onyx 1) that can intersperse materials of nylon, chopped carbon, and Kevlar (a material used in firefighting equipment) into a design. This means that the user can choose any durability for the needed application of the object. 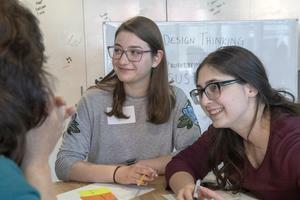 The First NYC STEM Lab group leaders brought the girls together for a sustainability prototyping activity, something akin to a Hackathon (extreme edition). This activity is focused on learning how to communicate an idea. As an example, the group leaders told the girls that when inventors were prototyping a cellular phone, volunteers were asked to carry around a wooden block. “The idea is to have the girls think about a problem and quickly prototype an idea in 1 hour,” said the volunteer. Each group was given a user, a challenge, and a constraint (something that they have to use in their solution). At another table, Nechama, Breindy, and Ayelet were designing floating gardens, powered by the river to release food to ocean life. (pictured on the left) Listening to the enthusiasm of the girls - “Oh, it looks amazing, “I need another female wire,” “Did we insulate that?” - was extraordinary. After the prototyping exercise, the girls heard from Diane Levitt, Cornell Tech Senior Director of K-12, who gave a talk on how information from the internet is used and whether or not it’s “creepy or convenient.” Finally, the girls had the opportunity to hear about WiTNY, an organization whose mission it is to increase the number of women in STEM fields. When designing the future of technology, girls need to have a seat at the table, said Judith Spitz, Program Director. “This was a tremendous experience for these girls. Today, only about 20% of tech jobs are held by women. CIJE girls were fortunate to experience this day at Jacobs Cornell Technion Institute to inspire them to continue studying and continue advancing their knowledge of engineering and other STEM areas”, commented Judy Lebovits, CIJE Vice President. The Center for Initiatives in Jewish Education is a non-profit organization providing schools with STEM resources, courses, and mentors that help expose students to multiple STEM problem-solving perspectives and hands-on technical skills that scientists and engineers utilize to help solve real-world problems.